November 22, 1963, was a triumphant day for the Beatles. In their homeland, the group had dominated the record charts for most of the year. Their last three singles, Please Please Me, From Me To You and She Loves You, had all topped the U.K. charts. Earlier in the week, the band was presented with silver disc awards (indicating sales of over 250,000 units) for their Twist And Shout EP (which by then had sold an incredible 650,000 copies, making it the largest selling EP in British history), She Loves You (which by then had nearly sold a million) and their first two albums, Please Please Me and With The Beatles, even though the latter LP had yet to be released. Although the Beatles had been creeping into the national consciousness for months, it was the group’s October 13, 1963 appearance on the television show Val Parnell’s Sunday Night At The London Palladium that elevated group had grown from a successful entertainment act to a national news phenomenon. The popular variety show was the British equivalent of The Ed Sullivan Show. That evening, over 15 million people tuned in to see the group perform From Me To You, I’ll Get You, She Loves You and Twist And Shout. The bedlam caused by the Beatles both inside and outside the theater caught the attention of British news editors. The Daily Herald heralded the coming of “Beatle-Fever!” The Daily Mirror mirrored these sentiments describing the mass hysteria as “Beatlemania!” The latter term became part of the British vocabulary and would soon be heard throughout the world. Three weeks later on November 4, 1963, the group played before British royalty at the Prince of Wales Theatre in London as part of the Royal Command Performance. The group entertained the elite crowd with From Me To You, She Loves You, Till There Was You and Twist And Shout. Prior to the star of their last number, John quipped, “For our last number I’d like to ask you help. Would the people in the cheaper seats clap your hands? And the rest of you, if you’ll just rattle your jewelry.” Click here to see their performance. The next morning, manager Brian Epstein departed London Airport for a visit to New York City. One week after the group performed before the Queen Mother and Princess Margaret, Brian met with Ed Sullivan in hopes of arranging appearances for the Beatles on Sullivan’s popular variety show, which aired on Sunday nights on the CBS television network. The two reached an agreement that the Beatles would appear on The Ed Sullivan Show twice, first on February 9, 1964, broadcast live from New York, and then on February 16 live from the Deauville Hotel in Miami Beach. In addition, the Beatles would tape an additional performance, which could be shown later in the season. Although the group was virtually unknown in America at the time the deal was made, Sullivan thought it was worth the investment, believing that the mass hysteria caused by the group in their homeland could be duplicated in America. Sullivan’s faith in the Beatles would soon be justified when the London bureaus of American magazines and television networks began reporting back to the States of strange happenings across the Pond. But to fully understand why it would take a few more months for Beatlemania to explode in American, one has to be aware of how different people communicated in the sixties compared to today. In the sixties, there were no home computers. The internet had not even been dreamed of. The first communications satellite, Telstar 1, was launched on July 10, 1962, a little more than a month after the Beatles first recording session at Abbey Road. Not only were there no smart phones, but telephones were tethered to the wall. Long distance calls were considered an extravagant luxury due to their high costs. Tweeting was something that birds did. Put simply, we were not living in a global community. The media was also drastically different. There were only three major television networks, CBS, NBC and ABC. There were no networks devoted to news or entertainment. There were only a handful of news magazines. Rolling Stone would not begin publishing until four years later. People magazine was over a decade away. 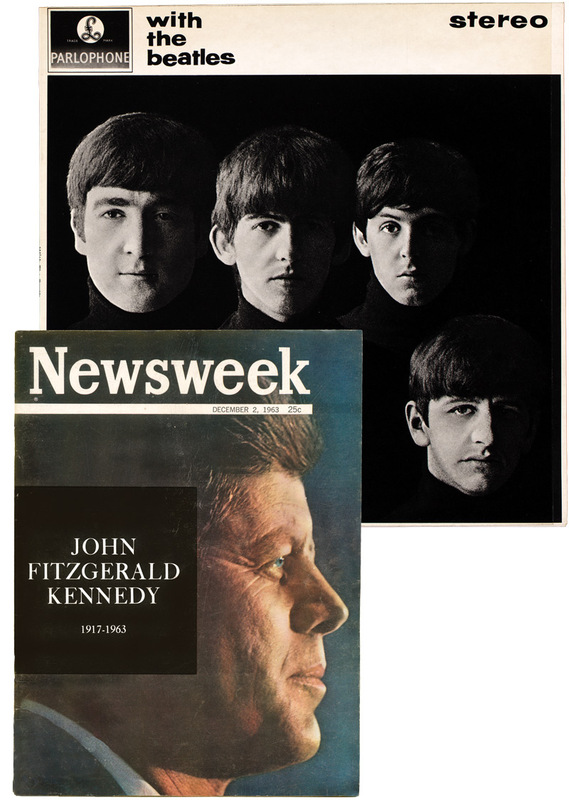 But in mid-November, 1963, two of the nation’s leading news magazines, Time and Newsweek, ran stories on the Beatles in their music sections. On November 18, NBC’s Huntley-Brinkley Report aired a four-minute story on the Beatles at 6:53 p.m. The segment, which utilized film of the Beatles and the crowd at the group’s November 16 concert at the Winter Gardens Theatre in Bournemouth, was filed by Edwin Newman, a correspondent based in New York who had previously headed the network’s London bureau. Although the broadcast was not recorded, the audio of the story was recently discovered. This can be found on the NBC Nightly News website. The Beatles were about to get even more exposure on November 22. CBS’s London bureau had prepared a five-minute story on the Beatles that was set to air that day on both the CBS Morning News with Mike Wallace and the prestigious CBS Evening News with Walter Cronkite. Early in the day, the CBS Morning News covered President Kennedy’s re-election campaign tour through Texas. The President had given speeches the day before in San Antonio and Houston before heading to Fort Worth to spend the night in the Texas Hotel. On the morning of November 22, he gave two speeches in Fort Worth and then head by plane to Dallas. The Beatles story was broadcast that morning, although no one remembers at what time it was featured. Click here to see the video. Meanwhile, back in the U.K., the Beatles new album finally went on sale. As President Kennedy and his wife were being warmly greeted by an enthusiastic crowd at Love Field in Dallas, British fans were buying copies of With The Beatles so that they could spend their evening with the Beatles. As the President’s motorcade was heading through the streets of Dallas, the Beatles were gearing up for their concert at the Globe Cinema in Stockton-on-Tees, Durham. Back in Dallas, three shots were fired at the President’s motorcade at approximately 12:30 p.m. Central Standard Time. Two of the shots struck the President, with the third and final shot entering his head. Kennedy was taken directly to Parkland Hospital, where he was officially pronounced dead at 1:00 p.m. Thirty-eight minutes later Walter Cronkite broke the news to the nation (click to see the video). By mid-afternoon, all three television networks were on the air non-stop broadcasting news surrounding the day’s tragic events. Because there was no regular evening news show that night, the CBS Beatles story was not shown again until December 10, 1963, at which time it helped jump-start Beatlemania in America. But that is a story for another day. I was part of the youth of America in the sixties and can speak firsthand on this matter. Although I was only eight and a half years old in November, 1963, I will never forget where I was and how I learned about the assassination. On that Friday afternoon, my third grade teacher was called out of the classroom by an assistant to the principal. About ten or fifteen minutes later she returned to the room looking shook up. Without saying a word, she went to the blackboard and wrote, “The President is dead. Class dismissed.” She then sat down at her desk, lowered her head and cried. I remember going to my cousin’s house and watching television coverage of the assassination that afternoon and evening. I remember hearing about Oswald’s death at Sunday School. I remember seeing highlights of the funeral procession on television. I remember the President’s son saluting the horse-drawn casket. I was shocked and saddened by President Kennedy’s tragi c death, but by the holiday season of 1963, I was over it. In early January, 1964, I heard I Want To Hold Your Hand on the school bus radio. The excitement of the music and quality of the singing immediately grabbed me. I was hooked. She Loves You, Please Please Me, I Saw Her Standing There, All My Loving and others had the same effect. The fact that they were British, had long hair and were cool was certainly part of it, but the main reason I embraced the Beatles is the same reason people do 40 years later–the quality of the music. In all due respect to President Kennedy, his death did not cause me to become a Beatles fan. I have discussed the alleged connection between the Kennedy assassination and the popularity of the Beatles with many first generation American Beatles fans. None of these individuals believes that President Kennedy’s death played any part in his or her attraction to the group. Admittedly, this is by no means a scientific survey, but I have yet to find any evidence to support the connection, which has been written as gospel in countless books, magazines and newspapers. When one looks beyond the United States, the connection becomes even more tenuous. The Beatles were extremely popular in England, Japan, Germany, France, Italy, Australia, Denmark, Sweden, the Netherlands, Canada and several other countries. None of these nations was suffering the trauma of having its head of state assassinated, yet the youth of these countries embraced the Beatles. Although the death of President Kennedy did not cause Americans to fall for the Beatles, it may have indirectly contributed to the group’s success in the United States. The saturation coverage of the Beatles by the American press in early 1964 closely parallels the conduct of the British press a few months earlier. Philip Norman, in his Beatles biography Shout!, theorizes that the massive coverage of the Beatles by the British press was in response to months of reporting somber events. “By the end of September, every editor on Fleet Street was looking for a diversion from this incessant heavy news – something light; something unconnected with the aristocratic classes; something harmless, blameless and, above all, cheerful.” Beatlemania proved to be the perfect escape. Beatlemania was fun to cover regardless of how one felt about the four young lads from Liverpool. Members of the press who found the group charming enjoyed reporting on the mass hysteria created by the band. Those who hated the Beatles or failed to understand their popularity took great pleasure in mocking the group and its fans. Their negative and condescending comments served only to strengthen the resolve of the group’s devoted followers. By keeping the Beatles in the news, the press helped fuel Beatlemania in America. Thus, while President Kennedy’s assassination did not cause the youth of America to embrace the Beatles, it may have led the press to give more coverage to the Beatles, which in turn helped spread Beatlemania throughout the United States. Copyright 2013 and 2003 by Bruce Spizer. Click here to sign up for Bruce’s email series on what was happening with the Beatles 50 years ago.